For men & women of all ages. With 10?g vitamin D3 per daily intake. The UK's no. 1 calcium formula. The Queen's Awards for Enterprise: Innovative 2018. Does not contain any drugs or hormones. Gluten free. No lactose, yeast or preservatives. Vegetarian Society approved.Food Supplements Calcium, magnesium, vitamin D, zinc which contribute to the maintenance of normal bones UK's No 1 for Bones* * UK's No.1 bone health supplement brand Osteocare® has been scientifically developed on the basis of the latest research to include calcium, magnesium, vitamin D and zinc which all contribute to the maintenance of normal bones. Getting enough calcium is important for men and women of all ages, especially during pregnancy and breast-feeding, as well as during and after the menopause. 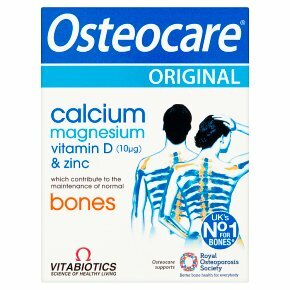 Balanced with essential Magnesium Osteocare® provides a natural source of calcium carefully balanced with essential magnesium and vitamin D which also contribute to the maintenance of normal muscle function. Advanced formula No other supplement provides the exact Nutrient Reference Value of Calcium and Zinc, with 10?g Vitamin D3, Magnesium and four additional supporting nutrients. Directions Two tablets per day with your main meal. Swallow with water or a cold drink. Not to be chewed. Do not exceed the recommended intake. Osteocare® can be continued for as long as required. Food supplements must not replace a varied and balanced diet and a healthy lifestyle.<br>As with other food supplements, consult your doctor or pharmacist before using if you are under medical supervision, have epilepsy, suffer from food allergies, or are allergic to any of the ingredients. Not suitable for children.